I admit it. I was a messy desk person for years. And years. When I worked as an attorney in private practice, my assistant would regularly come into my office and ask for a document, looking dubiously at the piles and stacks of papers and files on my desk and on the floor.I would think for a second or two, reach into a pile and voila! I could pull out what she needed pretty quickly. I was proud of my messy desk and my piles. Maybe I’ve outgrown whatever psychological need my messy desk fulfilled, but a few months ago (July 30th to be exact), I realized that I dreaded going into my home office to work at my desk. I had been working for a couple of weeks at the kitchen island, telling myself that the new sofa and rug made the great room the best room in the house. Why wouldn’t I want to spend time there? 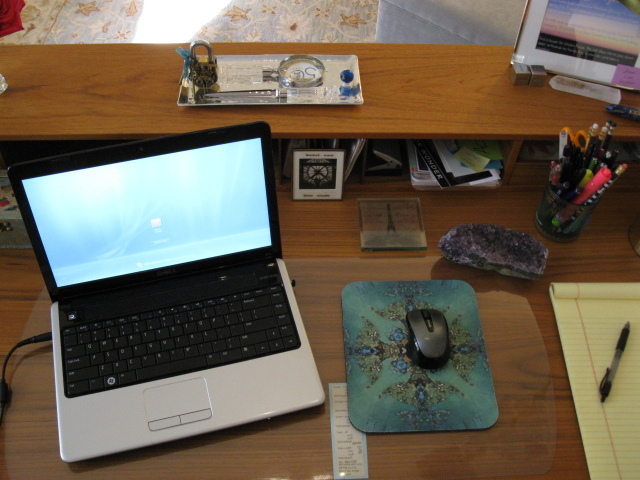 There was barely space to set a glass of water or a cup of tea, much less to spread out work documents or reference books. The physical clutter was creating mental clutter and stagnation on so many levels. 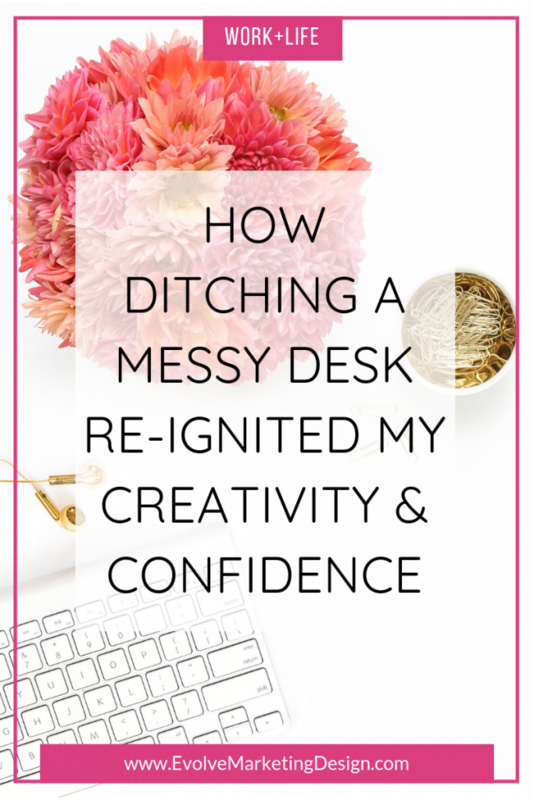 And I was feeling like a fraud; after all, one of the basic tenets of my design business is “where you work affects how you work.” I’ve written reports about it, and written about how to clean off your desk. But I wasn’t doing it. Hmmm. There had to be something else going on. 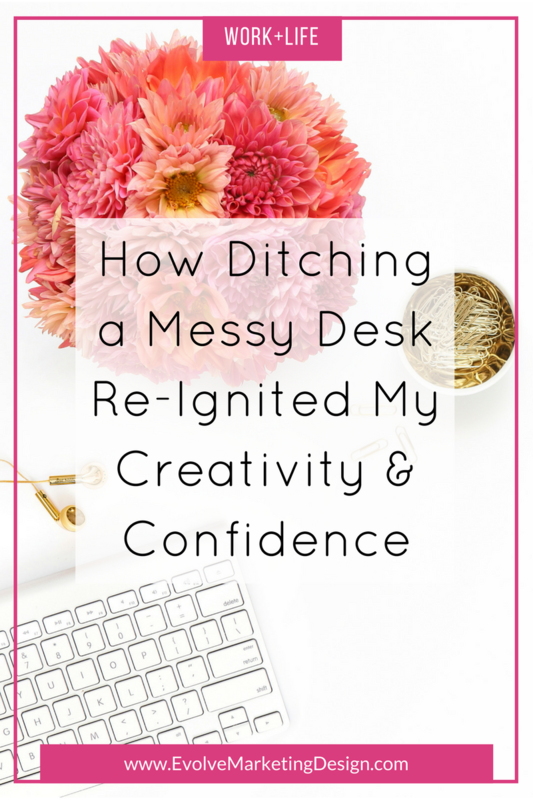 Armed with that curiosity and an intention to make a permanent change, I embarked on a challenge to not only clean off my desk, but keep it clean for 30 days and see if it made a difference. Well, it’s been more than 75 days and I’m happy to say, my desk is still clean. Turns out, it’s an actual thing. Desktop Zero. Kind of like Inbox Zero, but for your physical workspace. The difference in my energy, attitude and confidence working with Desktop Zero has been nothing short of extraordinary. I love walking into my home office every day. I feel happy sitting down at my desk. It seems happy, too. My work is more focused and efficient. I have everything I need at my fingertips. I feel inspired. I have physical space to work! I have mental space to think and create. And when I’m getting more done, feeling great about my results, and having new ideas—guess what? These are all confidence builders. Mindset changers. So that’s the simple thing: Desktop Zero. Not easy, but simple. 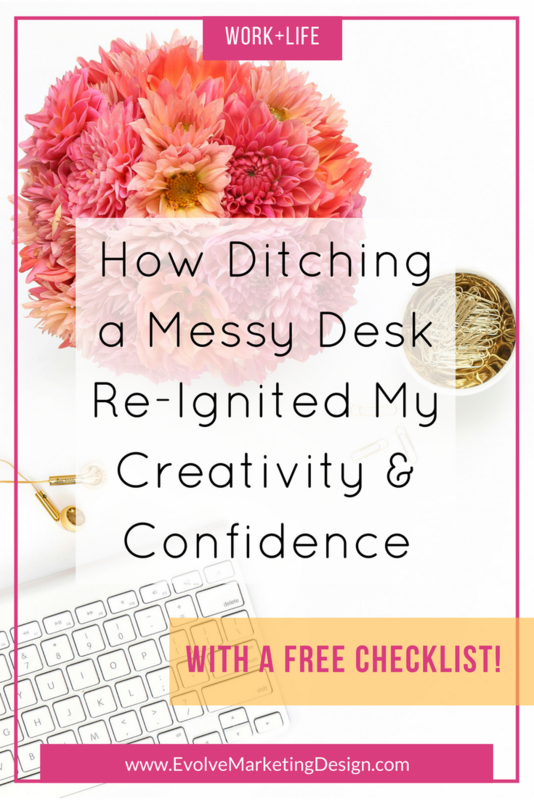 If, like me, your desk is a long way from Desktop Zero, I’ll share the steps of my process to get there, in hopes that it inspires you to clean off your work space and keep it clean—and see what might happen for you and your creativity and business! 1. Find some inspiration. 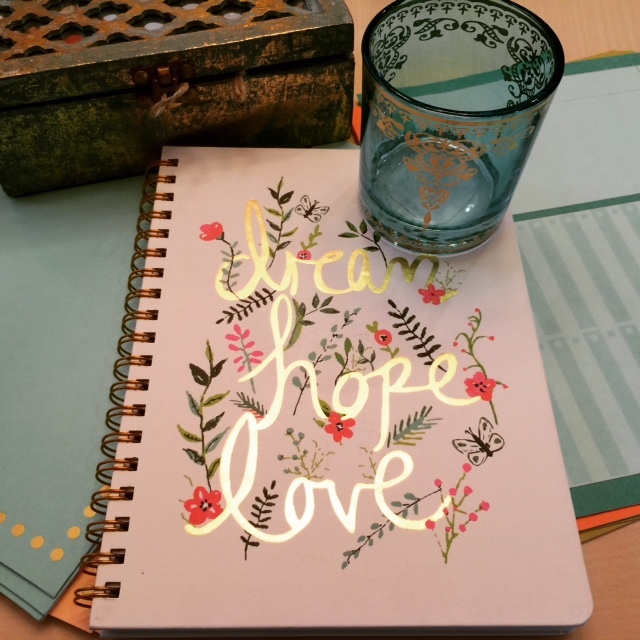 For me, getting to that “enough is enough” point was the spark, but finding some very cute and inspiring accessories at Home Goods (above) helped push me over the edge of inspiration. I chose a teal color palette based on a pencil cup (it’s actually a tumbler for the bathroom), an intricate wood box from India and some pastel file folders. I couldn’t put these beauties on a messy desk! 2. Clean off the desk. Literally get everything off the desk surface and any cubbies. I used the method I normally do: trash, action, file. This time I added bins for “relocate” – things that belonged in another room or in the supplies cabinet and “donate,” and then a separate pile for shredding. 3. Look at your pain points. As you’re cleaning off the desk, look for patterns in the piles. What’s in them and how did they get there? For me, I discovered that I tossed receipts and business cards from business trips on the desk (there was no designated place for them) and dropped random items on the desk just because they belonged somewhere in the office. For example, when I would unpack from a trip, anything that is stored in the office like my camera, travel power cords, or books, I would just put them on the desk and not put them away where they belong. Instant clutter! Over time, it built up into overwhelming mountains of stuff. Once you know what you’re dealing with, you can design a solution or process to handle the pain points (more on that in a minute). 4. Clean your desk. Dust, vacuum, polish, wax—whatever is best for your desk. I dusted and applied a nice coat of lemon oil to my teak writing desk. 5. Replace only what is necessary on a day-to-day basis. I have a rule that a desktop is for creating, inspiring and working. It is not for storage. So my desktop has a lamp, pen cup, computer, a small box for paper clips and such, a notebook, a legal pad and a stand up file organizer for frequently (daily) used files. On the little shelf on top of the desk I keep a few inspiring photos, letter opener and a vase of flowers. 6. Address pain points. This step will depend on what you identified as the major causes of clutter in step 3. In my home office, I dealt with the piles of receipts by creating a folder for them. I created a “home” for the receipts. And more importantly I resolved to put things where they go, rather than dropping them on the desk to put away later. I literally timed how long it took to put back a book, put my tote bag where it belonged, or to put an event folder in its storage box. Each task averaged about 20 seconds. I’m not kidding. Assuming everything already has a home, it takes seconds to put things away rather than stacking or piling them until they become a messy pile that can take an hour of precious time to tackle. Time it yourself! 8. Put everything away at night. At the end of the day, no matter what you worked on, put everything away, leaving only the essentials on the desktop. No, really. At the end of every day put everything away—no matter what. Even if it’s the thing you’ll keep working on first thing in the morning. Put. It. Away. This is the secret! This is Desktop Zero. Just try it for 30 days. Once you clean off your desk, address your pain points and get into the habit of keeping it clean and clear every day, you’ll see how you feel coming in to your office in the morning. See how it affects your mental clarity, focus, creativity and confidence. 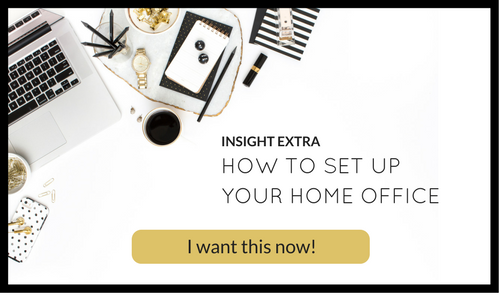 If you’d like to dive deeper into this topic, I’ve put together the 5 essential elements for a productive, energizing home office in this e-book “How to Set Up Your Home Office.” Click below to grab your copy for free! Let me know how this works for you! Comment below or share your story on Facebook. If you’d like to book me for a consultation to get your home office on track, please contact me at deanne@deannemarie.com.